After last week being sensationally omitted from the Olympic British Soccer team David Beckham, the LA Galaxy midfielder and world soccer icon, has been offered another more suitable role during the Olympic Games. Beckham, 38, will now appear at the games in a rubber suit as one of the official mascots for the games - Wendlock. Wenlock and Mandeville are the official mascots for the 2012 Summer Olympics and Paralympics. The mascots that look like aliens will run around the running track, edge of the swimming pool, across the firing ranges in the shooting competitions and carry the signs indicating which round is next in between rounds during the boxing competition. 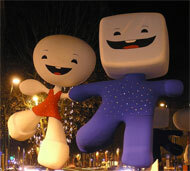 Wenlock and Mandeville are animations depicting two drops of steel. They are named after the Shropshire town of Much Wenlock, which held a forerunner of the current Olympic Games, and Stoke Mandeville Hospital, a facility in Buckinghamshire that initially organized the Stoke Mandeville Games, the precursor of the Paralympic Games. Beckham is said to be thrilled that he is to take such an active part in the games. "I knew they wouldn't forget me" smiled Beckham as he donned his Wenlock outfit for the first time, "I mean, I'm David Beckham!" he said as he put on his new head. Also getting an Olympic call up to assume the role of Mandeville is South African Time-trial cycling ace Cherise Taylor who was omitted from the women's road cycling team for the Games and was considering suing the South African cycling association.